Bad Altitude Info Award | high road to.. This years Bad Altitude Info Award goes to Crespal Labs in Peru , for their suggestion to medicate against altitude sickness at Macchu Pichu – which will be the lowest point reached by 99% of Andean tourists . 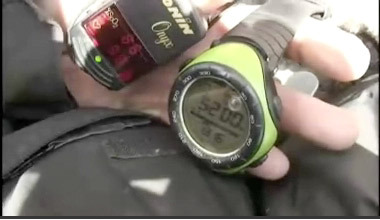 MP peak is at 2400 meters , i.e. similar to cabin pressure on airplanes , and a thousand meters lower than Cusco. The hotels in Aguas Calientes are several hundred meters lower. Salophene , which has been discontinued on the rest of the planet for many decades , metabolises in to more ASA and paracetamol/acetaminophen. 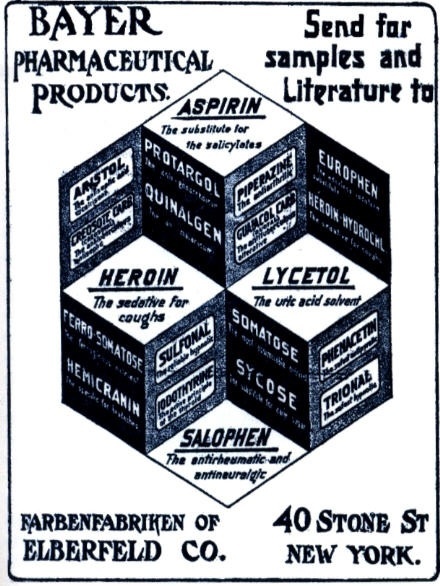 It was marketed by the German pharmaceutical firm. Bayer in the early 20th century. Later Bayer became the image of not only bad but Evil Pharma with another discontinued product : Zyklon B. This years runner up for rubbish non-commercial info is the Norwegian independent drug info site Relis.no , intended as a guide for prescribing doctors. Their posts on AMS prevention ( høydesyke ) contains repeated mentions of up to five times higher acetazolamide doses than present guidelines – and points to an article from the Norwegian Medical Society journal as source , which says the opposite. The advice seems well researched at a first glance , correct doses are given and there are a number of sources at the end of the document. LP lists a number of sources / suggested reading … which all are very solid , and all say the opposite of what LP claims . ” there is no evidence ” that Diamox has a masking effect. Feeling better with Diamox comes from the increased ventilation made possible by Diamox. * Last but in no way least : CDC , which are responsible for the national health guidelines in the US. CDC has consistently pushed for better/wider acceptance of preventive medication with Diamox in their altitude advisory ( shortlink : http://korta.nu/cdcalt ) . This year they published a separate Cusco advisory . Cusco is lower than Lhasa , and wording is more direct now : everyone travelling to Cusco should be prepared to prevent or treat altitude sickness with Diamox. LP brings up a number of alternative medications. First up is Rhodiola , which is called a Tibetan herbal medicine. Reading this as a uniqe local tradition is definitely off the mark : Rhodiola grows over wide areas over the world , including Russia , Sweden and China . The search for a medical use of Rhodiola started in the classical Greek period, re-surfaced with Carl von Linné and … Josef Stalin, the later being the main reason westerners today are aware of Rhodiola. The fuzzy wording “recommended by locals” leaves no clue if this is to be seen as a part of the Tibetan medical tradition , or if this is a word on the street thing , like the infamous soroche. pills in South America. The entusiasm for non-proven medication is not limited to Rhodiola : the proposed medication list also includes Gentiana against AMS , which will baffle …, basically everyone , including doctors and herbalists. To top it off the litteral Snake oil cures comes up : the classic Chinese cure of dried snake gall bladders against pneumonia (!) is mentioned. Extra points for bringing up “Sulphur allergy ” ( Sulphur is an essential trace element , used in the body, and routinely added to i.v. solutions ) The mixup here is with sulfonamides , where allergic reactions are in no way is certain between the antibiotic sulfonamides ( “sulfa” ) and the non-antibiotic group , like one of the worlds most common prescription medications , the diuretic furosemide. First nominee of the year : Peru travel info from Spiritual Adventures. Too good to be spoiled by a description , jump to the best part here. Continued in the comments part..
Just when you thought you had heard it all , from the Loveland Ski FAQ : make a solid foundation for your cerebral edema with low sodium diet , and high water intake – starting one week (!) before ascent. Runner up : the New York Times travel blog , for high lighting the dangers of the train ride to Lhasa – and failing to notice two separate oxygen delivery systems in every car , at every seat. Down , down , down … we have now passed in to total darkness , nothing is visible beyond our diving lights. The pressure around us builds up relentlessly , a cold hard vice with us in the middle , at the same time as the pressure in our tanks rapidly dwindlles. We push on and manage to glimpse the masts on the sunken schooner with low tanks , and claw our way to the surface on the the very last pound of air pressure. Should have brought a second tank. Topside ,with drinks in our hands and the sun setting over the South Sea it´s hard to believe that this world exist paralell to ours , just over the railing of the boat. No , this show never aired. Somehow losing control is not seen as cool in the context of diving. This is however how a diving story would have been presented if you had brought in the team from Packat & Klart , with the same perspective as they recently portrayed high altitude trekking in Nepal. This is probably the part where I start losing the attention of my Ladakhi & Tibetan friends , negative criticism is seen as an ego boosting trap. But there are times when it is useful to see how things go wrong , what mindsets takes you there. So bear with me as we tag along again with the reporters to Everest Base Camp and beyond. This is the first shot of the lead reporter , one week in to the trek. It´s an attention grabber , good TV. It´s also the beginning of a consistently broken timeline which is poor public television , in the sense of getting a good understanding of the subject at hand. Timing is everything in high altitude trekking and climbing : it decides everything from how you see colors to if you can hold down your breakfast. Ultimately it also decides how many come down from the mountain , every year a number of people develop pulmonay and cerebral edema , and at that point mortality becomes high. Some may also argue that timing is everything in media : early in to the show we are presented with an ironic view of the flight to Lukla , shown three weeks after the catastrophic landing that killed all but one . 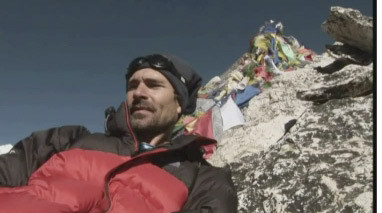 The programe is also aired the same week as the French ambassador in Kathmandu calls for better awareness and training in dealing with altitude sickness , after three French deaths in the same early in the season. The introductory theme of …suffering will be repeated a number of times from now. The back is suffering , the boots are suffering , dhal bhat is probably also suffering, the packs … somehow the two magical limits of twenty kilos and two packs are broken , on what basically is a teahouse trek , with a shared incomplete kit. Somehow not only the reporter but also the editors seem to read in a meaning in this suffering , the themes of pushing the envelope , taking yourself to the edge of endurance are repeated again and again. Self realisation through exhaustion. 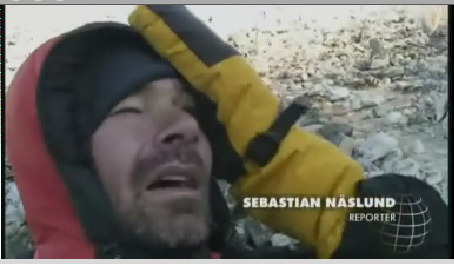 In a viewers submitted section we find another video from EBC , with the comment from the editors that the footage is TV quality images , but lacking emotional content and presence : they specifically ask for a description of aching lungs. Meanwhile , with or without packs we all will struggle in this situation : everyone who just has arrived at 3000+ meters has the same physical capacity as someone with chronic lung disease. It will get better , but not fast . This is October , around four thousand meters , and in shelter . It´s not that cold , especially in Swedish terms – in numbers. Which takes us back to time , and acclimatisation to altitude. There is no way to understand from the programme how fast they have arrived at this altitude , but this shot tells us one thing : fast. Being cold is intimately linked to incomplete adaption to altitude , with white cold hands and feet from constricted blood vessels in the periphery. So there is stress , and an oxygen saturation that normally would mean a change of pace in the emergency room or ICU. Before this acclimatisation has been mentioned a number of times , but without any real attempt at describing what it is . Is it how fast you walk , is it where you sleep , is it hours , days or weeks we are talking of here ? …even before Annelie turns up on camera , with slurred speech. It´s also the same symtoms the lead reporter recapitulates in the beginning of the program. So what comes next ? Of course they ascend even further (collective groan from the HRA clinic in Pheriche ) , the option of descending or even just remaining at that altitude isn´t even discussed in the program . Not surprisingly , they don´t make it to the top of Island Peak – but at least they make it down to Namche afterwards.